Two operatives of banned terror outfit Indian Mujahideen have been convicted by a local court for the 2007 Hyderabad twin blasts that claimed 44 lives. A metropolitan court in Hyderabad Tuesday convicted two 'Indian Mujahideen' operatives of murder and terrorism for the 2007 Hyderabad blasts where two powerful explosions ripped through a popular eatery and an open air theatre, killing 44 people and wounding 68, prosecutors said. Second Additional Metropolitan Sessions Judge (in-charge) T Srinivas Rao pronounced Aneeq Shafique Sayeed and Mohammed Akbar Ismail Chowdhari guilty in the 11-year-old case, but acquitted two other accused Farooq Sharfuddin Tarkash and Mohammed Sadiq Israr Ahmed Shaik for want of evidence. The prosecution has now decided to seek capital punishment for the convicts. All the four are natives of Maharashtra. The quantum of punishment as also the judgment on the fifth accused Tarik Anjum, accused of harbouring the perpetrators in New Delhi and other places, will be pronounced on Monday. "The prosecution proved the case against Aneeq Shafique Sayeed and Mohammed Akbar Ismail Chowdhari and they were convicted. The quantum of sentence against them will be pronounced next Monday," Special Public Prosecutor C Seshu Reddy told reporters after the verdict was pronounced inside a special courtroom at Cherlapalli Central Prison. The courtroom was out of bounds for media. The detailed judgement is likely to be available in 2-3 days, Reddy, who represented the counter-intelligence wing of the Telangana Police that probed the case, said. Three other accused including IM founder Riyaz Bhatkal, his brother Iqbal, and Amir Reza Khan are absconding. "Three others are absconding and we will proceed with the case against them once they are caught," Reddy said. Barring Anjum, all seven were charged with involvement in the two blasts as also the recovery of an unexploded bomb from under a foot overbridge in Dilsukh Nagar area. According to another Public Prosecutor K Surender, Sayeed and Chowdhari were found guilty of carrying out the blasts and convicted under various sections of the Indian Penal Code including 302 (murder), besides provisions of the Arms Act, and the anti-terror law--Unlawful Activities (Prevention) Act. The survivors and family members of the victims, meanwhile, sought capital punishment for the perpetrators. Chander Nayak, one of the victims who lost an eye in the blast, said he was disappointed with the acquittal of two of the accused and demanded that the state government appeal against their acquittal in the high court. "Under the Indian law, the highest punishment is hanging. I want those convicted to be hanged. Also, the government should seize all the properties of those convicted and distribute it among the survivors and the families of the deceased," Nayak, who held a placard that read 'Telangana CM should help the victims', said. B Anjaiah, who lost his daughter and two other close relatives, also wanted the convicts to go to the gallows. "It has been a nightmare for me...My daughter, who was just 14 then, and two of my close relatives lost their lives. I hope the perpetrators will be hanged," he told PTI. Syed Rahim, who was injured in the eye when the blast rocked 'Gokul Chat', also wants the perpetrators to hang. Premchand Vijayvargiya, one of the promoters of the popular eatery, who lost his four relatives and two workers, said he wanted 'the sternest of punishments' for the perpetrators. As the survivors and families of the victims sought death for the culprits in one voice, the Bharatiya Janata Party felt trial in terror cases should be fast-tracked. "Justice for those killed came quite late. Trial in such cases needs to be fast-tracked," BJP spokesman for Telangana Krishna Sagar Rao told PTI. "(Trial of) Such cases should be speeded up. Fast track courts should be set up. There will be fear if judgments come in a limited period. Speedy justice should be done," said P Sudhakar Reddy, deputy leader of the Congress in the Telangana Legislative Council. All India Majlis-e-Ittehadul Muslimeen president and Hyderabad MP Asaduddin Owaisi said the judgment did not bring a sense of closure or justice to the families of the victims. 'FAROOQ & SADIQ have been in prison from 2009 & after 9 years Court finds them NOT GUILTY acquits them & their Lawyer ABDUL Azeem tells me evidence was circumstantial & eyewitnesses who where found after 1 yr of offence No closure/Justice for victims families Pain continues,' Owaisi said on Twitter. All the Indian Mujahideen operatives who faced trial were arrested by Maharashtra police's Anti-Terrorism Squad in October 2008. Around 170 witnesses were examined during the trial and arguments concluded last month.. The following is the chronology of events relating to the August 2007 Hyderabad twin blasts case. 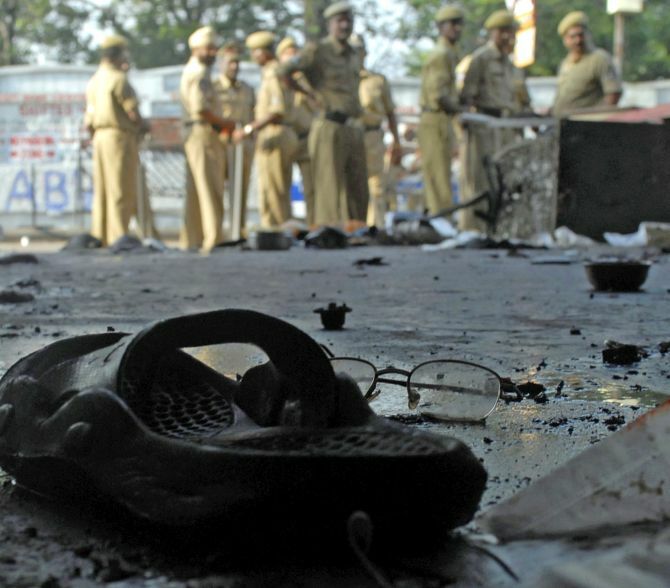 August 25, 2007: A bag containing an improvised explosive device (IED) explodes at Lumbini Park claiming 12 lives, mostly students from Maharashtra and also leaving 21 injured. Another blast in Gokul Chat eatery in Koti area leaves 32 persons dead, 47 injured. January 2009: Alleged 'Indian Mujahideen' operatives Anique Shafique Sayeed and Mohammed Akbar Ismail Chowdhari arrested by the then undivided Andhra Pradesh Police. March 2009: Two other accused -- Farooq Sharfuddin Tarkash, Mohammed Sadiq Israr Ahmed Shaik -- arrested. May 2009: Chargesheet filed in Lumbini Park blast case. May 2009: Chargesheet filed in connection with recovery of an unexploded bomb at Dilsuknagar. June 2009: Chargesheet filed in Gokul Chat blast case. June 2018: Trial against the accused shifted to a court hall located on the premises of Cherlapalli Central Prison from a court located in Nampally Court complex. August 2018: Final arguments and counter arguments completed. September 2018: Verdict delivered by local court. Two 'Indian Mujahideen' operatives -- Aneeq Shafique Sayeed and Mohammed AkbarIsmail Chowdhari -- convicted, while two other accused -- Farooq Sharfuddin Tarkash and Mohammed Sadiq Israr Ahmed Shaik -- acquitted. Did Dubai hawala money fund Hyderabad blasts?